When it comes to Italian food, I'm really picky. It has to be fresh and real, authentic Italian. Otto hosted our family for lunch last weekend. I was excited to give it a go since it's owned by renowned chef Mario Batali who has hosted the popular television show "The Chew" on ABC. 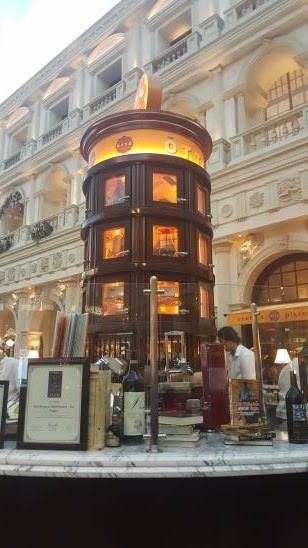 Otto Las Vegas is located inside the Venetian within the Canal Shops. When we arrived, we were greeted by the host and seated at a table where we had street performers and the beauty of being right in the heart of Canal Shops - what a great view! Otto offers a very diverse and decedent menu, full of variety! Our service first brought us out a tray of Brushetta with a variety of cheeses and fruit. Wow! Incredible, so light on the tongue but bursting with flavor! My favorite was the goat cheese with cherries, it was a dessert all on it's own. Simply amazing! The Brushetta is the only one that is not aged in house. Fruits are also obtained from the local Farmers Market when possible. Next up was there popular, Black Spaghetti. Yes, it actually is black! 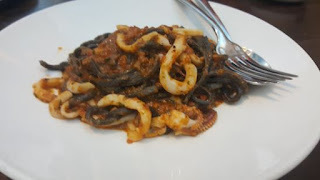 Black Spaghetti is a sicilian pesto with black noodles and calamari. It did not catch the eye in the way of being appealing, but the taste over came that. The noodles practically melted in your mouth and for someone who is not a fan of calamari, I could not even tell what I was eating. Everything just blended together perfectly. The pesto sauce tasted so fresh as it was just made straight from the garden! We are parents, with two picky teens to feed and if you are worried that Otto may not be for your family - I'm here to tell you, you are wrong! They do have a dedicated kids menu, which includes the pizza below. While they don't have the household pepperoni that we all eat monthly, this was way better! 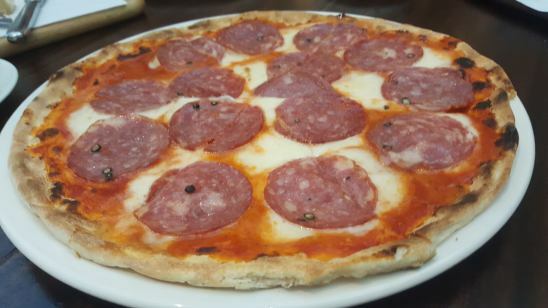 Below is their Salami Cotto Pizza for only $12! Very affordable and it's really a much better taste then your household cardboard pizza. It's fresh, as fresh as you can get and they kids absolutely loved it! Now my husband and I have two must haves - meat and dessert! 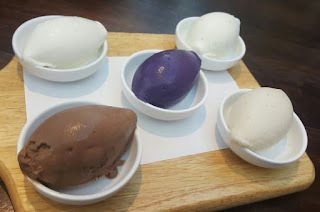 We ended our meal with their popular Braised Pork Shoulder as well as a Gelati Tasting. The presentation of the pork was just stunning and you didn't even need a knife as the meat was so tender, it just fell apart. 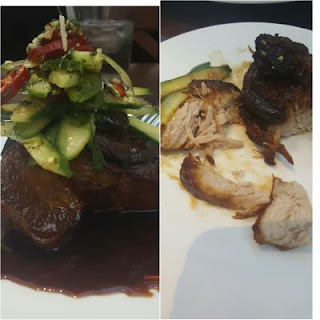 The cucumber stacked on top of the pork was the perfect match, the crunchiness that it added was off the chart. Now who doesn't love Gelati? Their Gelait is made in house. We sampled the grape, apple, peanut butter, chocolate and their olive oil and sea salt. 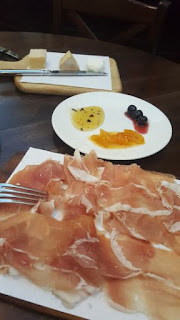 My husband loved the grape the best, my favorite was the olive oil and sea salt. I know it sounds incredibly weird to have an olive oil Gelati, buy it's a must try! We really had an enjoyable time, the staff was very observant and took care of our every needs. I was highly impressed that they even brought out a new set of plates and silverware for every course. 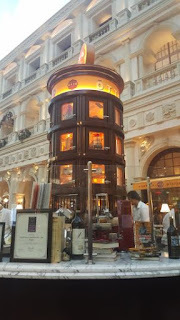 Given the quality of the food, the service and the entertainment surrounding, it is a very affordable restaurant on the Las Vegas Strip, inside the Venetian. It is very family friendly, but also classy enough for a night out on the town with your loved one. In Italian, Otto means "8", representing the restaurant's original location on 8th street in New York. Otto offers a different special for every day of the week. In Italian, OTTO means "8," representing the restaurant's original location on 8th street in New York. Enoteca is the term used in Italy for small, local or regional wine shops where guests may sample wines from area producers.